London fashion week I believe is the only fashion week that allows new/creative and inspirational desingers to flourish, with New York, Milan and Paris showcasing desingers whom already have a name for them selves. 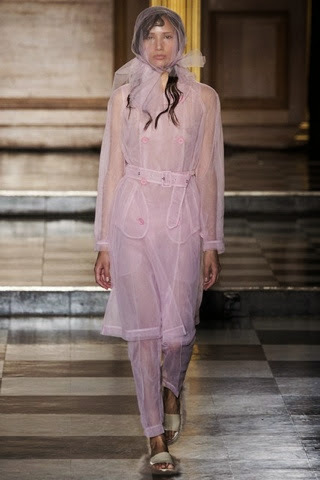 Simone Rocha is a fairly new desinger however within her short career she has shown what talent she has. This collection was pretty and elegant with design techniques ranging from aplliquied flowers, scalloped edges, lots of tulle and sheer fabrics. Black, white and pink ruled the coloured scheme apart from the crazy appliqué florals. Below are some of my favourite looks from the collection however the sheer fabrics are beautiful but very daring! !